X-ray image of the central region of the starburst galaxy M82. Of particular interest in this image is the bright source near the center of the image, which is offset from the dynamical center (small green +) of the galaxy by about 600 light years. This source was seen to increase dramatically in intensity over a period of three months (compare left and right panels) after which it decreased in intensity. A pattern of variability such as this indicates that the source is a black hole. This is the first confirmed case of such a large black hole outside the nucleus of a galaxy, and is believed to represent a new type of black hole formed by the merger of scores of black holes, or by the collapse of a "hyperstar" formed by the coalescence of many stars. 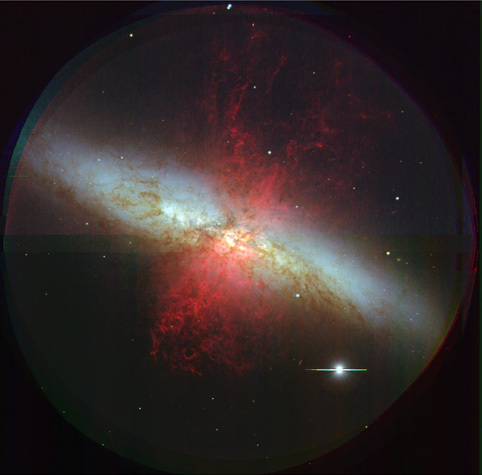 Chandra observed M82 six times for approximately 30 hours total. Some of the observations were made with the High Resolution Camera (HRC) and some with the Advanced CCD Imaging Spectrometer (ACIS) X-ray camera. The spread-out appearance of the X-ray source is an instrumental artifact. The distribution of the X-rays is consistent with this source being point-like. Note: The previously announced 600-second oscillation reported from M82 was found to be an artifact of the data screening procedure used to eliminate spurious events produced by the HRC detector electronics. This does not alter the conclusion that confirmed the existence of a mid-mass black hole 600 light years from the center of the galaxy M82. That conclusion was based on the observed intensity of the source and the accurate location for the source, which are unaffected. Scale Image is 30 arcsec across.